We give you social data. You raise more money. 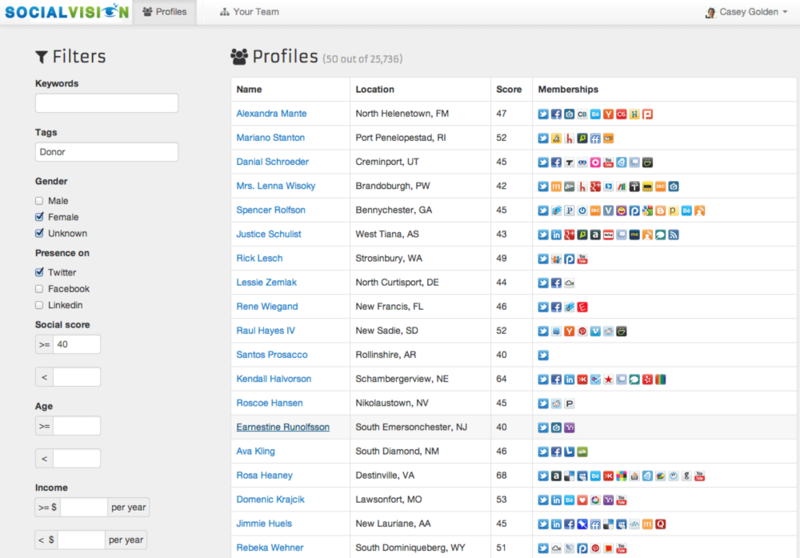 Want to find the hidden sustainers, advocates, team captains and other gems in your database? SocialVision -- a cloud-based, social data insight platform -- is the answer. No matter where you are in your organization, social intelligence will take your work to the next level. Learn more. Sign up early for our beta and we'll give you a free account with 2,000 profiles - a special offer valid ONLY for Foundation Center newsletter subscribers! (Click to enlarge) Find hidden gems in your database! Thank you! We'll be in touch in the next few weeks, once SocialVision launches into public beta.